Gregorio “Ori” Reyes thought there was nothing left for him in Hawaii. A former Army Ranger and promising MMA fighter, his dishonorable discharge turned him into the family disgrace, and his childhood best friend Kalani never could love him back--not the way Ori needed to be loved--even before Kalani’s doctors declared him to be in an unrecoverable coma. Ori’s return to Hawaii seems fated to be a depressing reminder of every chance he never took... until Kalani himself impossibly welcomes him home. Kalani’s body is bedridden, but his spirit is free to roam, and it turns out it’s not just Ori who had unspoken yearnings. Kalani is eager to prove that he can still savor all the pleasures of this world. Together, they remember all those years of surfing, wrestling, touching and aching but too afraid to act; now, they cross that final barrier and struggle against each other in an entirely different way. Passionately but tenuously reunited, the pair must solve the mystery of Kalani’s unlucky life, sorting through dark family history and even journeying to the Hawaiian ghostworld. And the greatest terror of their journey is that Ori might have to put Kalani to rest. Gregorio “Ori” Reyes and Kalani Lihilihi have known each other since childhood. Although they were always very close, Ori left home to serve in the Iraq war before either man had a chance to explore the strong feelings growing between them. A vicious hate crime leaves Kalani’s body comatose in the hospital while his spirit wanders freely. Ori was dishonorably discharged from the military and served some time in prison. He returns to his home in Hawaii, disconsolate and penniless, blaming PTSD for his visions of Kalani. These visions are very real, and for the first time, both men have a chance to overcome the pain of missed opportunities and regrets from the past. Through flashbacks, the reader gets a glimpse of Ori’s and Kalani’s childhood and teen years, their family and friends, Ori’s stint in Iraq and his brief stay in prison, Kalani’s brutal assault, and the mystery of his parents’ deaths. What starts out as a rather conventional love story, turns into something quite surprising and unexpected when Ori and Kalani embark on a journey through the spirit world, where dangers lurk, curses must be reversed, and lives are healed. This is a very thoughtful and moving story that I personally feel could have benefitted from first-person dialogue. Many times I wanted to get into Ori’s head and know the depth of his feelings, but mostly I felt somewhat distant from the main characters until well into the novel. The flashbacks, while very effective and essential to the story, slowed the pace for me and made the story seem a lot longer than it actually was. 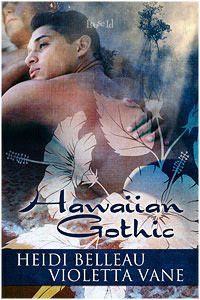 I loved the vividly described Hawaiian setting and culture and the emotionally-charged and beautifully written love scenes. This highly original non-traditional romance should appeal to adventurous readers.